Magnus Karlsson got his M. Sc. in 1991 and his Ph. D. in 1994 from Chalmers University of Technology, Sweden. The title of his Ph. D. thesis was "Nonlinear propagation of optical pulses and beams". 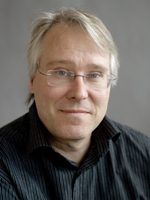 Since 2003 he is professor in Photonics at Chalmers, devoted to research in fiber optics and optical communications. He teaches or has taught undergraduate courses in "Wireless and photonics system engineering", "Photonics", and "Fiber optic Communications". He also teaches post-graduate courses on "Nonlinear fiber optics"and "Fiber optic polarization effects". Which is the most power-efficient modulation format in optical links? Ultrashort solitons at the minimum-dispersion wavelength: effects of fourth-order dispersion. Dynamics of self-focusing and self-phase modulation in a parabolic index optical fiber. There might be more projects where Magnus Karlsson participates, but you have to be logged in as a Chalmers employee to see them.